We are learning a lot about Sardinian culture! 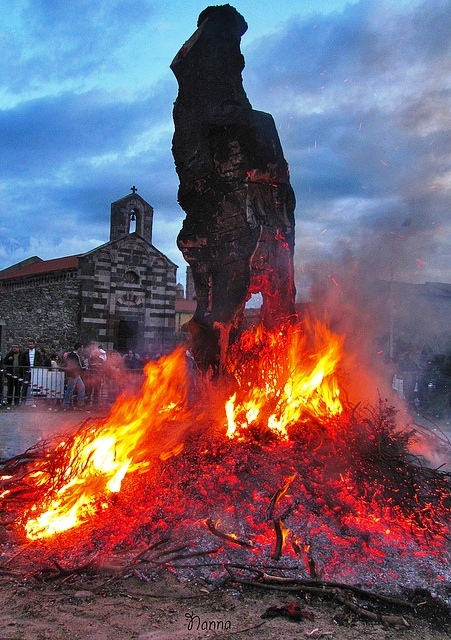 On the 16th and 17th January, in several Sardinian towns will be celebrated the S.Antonio Abate's day and the suggestive fires lit up the night. The celebrations mark the beginning of the one of the most important events in Sardinia: the traditional Carnival. The typical Sardinian masks show up for the first time in the year and all around the bonfires there will be dances and songs together with a good glass of wine. After the blessing of the wood, the fire flares up and lights up the night, the flashing goes up to the sky and seems to mingle with the stars: then people gather, dance and drink the best wine and eat the sweets made for the occasion. In some towns , as the fire burns out and the wood starts to cool a bit, people get the black embers with the hands and it could happen that somebody fondles your face with hands dirty of soot...don't worry it means that they are wishing you good luck. In other places, especially where the fire is lit as a votive offering, people keep the embers as relics wich should turn away the bad luck.